The iconic coach and his seventh-seeded squad begin a first-round series Saturday against the Denver Nuggets , who are a little lean on playoff experience in returning to the postseason for the first time since 2013. The second-seeded Nuggets caught the NBA world by surprise this season behind the play of All-Star big man Nikola Jokic. Denver doesn’t exactly possess a ton of postseason experience. Namely, Paul Millsap, Mason Plumlee, Will Barton and Isaiah Thomas , who hasn’t played much after Malone shortened the team’s rotation. THE STREAK: San Antonio’s playoff streak of 22 straight is tied with the Syracuse Nationals/ Philadelphia 76ers for longest in NBA history. It’s the longest active streak of the major North American sports, ahead of the NHL’s Pittsburgh Penguins (13), NFL’s New England Patriots (10) and MLB’s Los Angeles Dodgers (6). HOME COOKING: At 34-7, the Nuggets had the best home record in the NBA. The Spurs have won 13 straight over Denver in San Antonio. 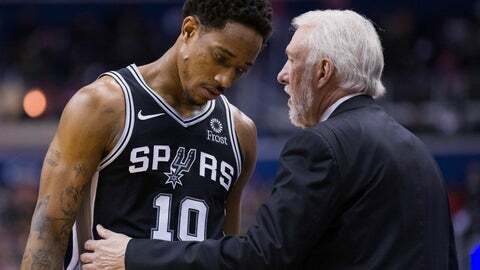 THE LITTLE THINGS: The Spurs had the fewest turnovers in the regular season (12.1 per game), the highest team free throw percentage (81.9) and the highest 3-point percentage (39.2). “We have to be real disciplined with this team,” Murray said.